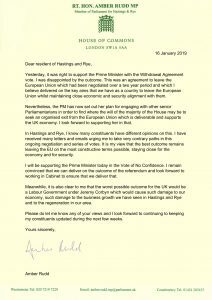 Shortly after the defeat of the government’s Brexit bill last Tuesday, January 15, Hastings and Rye MP Amber Rudd issued an open letter to all her constituents, which we reproduce below. You may or may not agree with all the sentiments she expresses but you will note that in her last paragraph she asks for our views – do let her have them. If we, as voters, are to have our voices heard in this long-running saga, then it is important that, whatever political affiliations we may have, we need to tell her. This does not, of course, mean simply hurling insults – that achieves nothing. But let her have your considered thoughts on what you feel should be part of the Leave agreement and, if possible, the reasons for them. If correspondents from Rye come up with a consensus on preferred next moves, our MP has the ear of the Prime Minister and it is not inconceivable that our small town could yet have some influence on the final outcome. All her contact details are on her letter, but email, if possible, is probably the best one to use. Forgive my scepticism, but the idea that Amber Rudd, one of the most prominent Remainers in government, truly wishes to hear the views of the majority who voted to leave the EU is beyond belief. Ms Rudd was elected on a manifesto promise to honour the result of the referendum, something which she and her government has failed to do. We did not vote to ‘stay close’ to the EU’s (failing) economy or anything else. The vote was binary, there was no mention of ‘deals’, and we chose to leave. The UK successfully trades under WTO rules with almost every country in the world (including the USA and Japan) so we have nothing to fear from refusing to pay £39 billion in Dangeld to the EU and simply going our own way. That is what we voted for. That was what we were promised. Now will she and her colleagues please get on with it or, if not, make way for a government that will? The ‘only alternative government’ is a Corbyn-led Labour one? On the contrary. If Mrs May were to resign (and perhaps take Ms Rudd, Mr Hammond and Mr Robbins with her) it would be perfectly possible for this country to have a Conservative government that was willing, unlike hers, to abide by its manifesto. As for an agreement acceptable to the EU, we have been offered one and have been told repeatedly that there is no more to come. Were we to accept it, we would be bound to the EU forever, with no say in its conduct, no redress and no way out. Finally, regarding a ‘people’s vote’ who do its proponents believed voted in the first one? And if that should happen and fail to deliver the answer Europhiles wish for, are we then to have a third or a fourth until, like Ireland, they get the answer they want? More accurately termed a ‘losers vote’, the whole idea makes a mockery of the promise made to this country and casts doubt on any promises made on any subject by future governments. Politicians are held in low enough esteem already and they would be wise not to risk what little remains by indulging in such shenanigans. Parliament has resulted in a wasteful muddle and selfish motives. MPs have shown that forum cannot sort it. What other causes could have benefited from the time and money spent – services, education, climate change? Theresa May immediately announced her mantra that Brexit means Brexit, and has stuck to it like glue, but that vote was made in ignorance , she ignores this. She insists the people decided – well verify the decision now in the light of BETTER INFOMATION and free from selfish or confused MPs and cross party motives.. The simplest and democratic solution is another PEOPLE’S VOTE We were not properly informed. Some say it could be organized and done within 6 months, why not less? The initial one was uninformed, simplistic, and, according to the recent BBC’s factual but dramatised portrayal, cleverly , expensively, secretly and unscrupulously manipulated (Cambridge Analytica etc) by Brexiteers. and ended with the man hired to engineer this (played by Benedict Cumberbatch) pleading for someone with inspirational vision to step into the morass and lift it into a higher plane . On so many counts leaving the EU would be a big mistake. To lose our relationship with the other countries of Europe and ability to influence decisions, to retain good smooth trading terms. The EU has meant that old feuds amongst European nations have been halted and the danger of war averted. The vast number of decisions regarding ourselves we can still make and a common standard thought Europe must be in everyones interest. First off, it is a myth that the vote to leave meant leaving at any cost, deal or no deal. That is not at all what people in government who supported to leave told us during the referendum campaign. We we were explicitly told they would get the best deal for Britain and leaving without a deal is not a good deal for this country. The comment above from Mr Cooper that we currently trade using WHO rules with most countries of the world is not accurate. The BBC reported on this on 6 November 2017 and provided useful information about the WHO and the countries that use it. Under the EU we trade together as a block with 64 countries and under WHO only 24. Why would China, the US, Brazil of Taiwan give the UK a better trade deal than with the much larger, much more economically viable EU? The reality is that this would not happen as these countries would not want to undercut their relationships with the EU. The EU has also recently negotiated a massive trade deal with Japan that goes into effect in just a few weeks and we would lose out on those benefits by leaving. And aside from the economic arguments, we have been at peace with our EU neighbours who are our friends and allies for decades. We have benefited massively from our trade and cultural, scientific, security, social as well as economic benefits. We need a people’s vote that gives us truthful options such as leave, remain, support the deal negotiated by Mrs. May. The fantastical promises made by the leave campaigners have been shown not to be true. Let the voters have a say on what we know now and then let that result be the final result, whatever it is and then we can go forward and hopefully heal the divisions across the UK. Ms Rudd’s scare tactics about the horrors of Mr Corbyn are embarrassing. May I remind her she won the last election by less than 400 votes. He would not be my choice for PM but the accusations made about what would happen to the UK if he were in power are ridiculous. At risk of becoming a bore, as Prof. Camic has chosen to take issue with me about the WTO agreement, perhaps I might be allowed to respond. Rather than relying on the BBC, a more reliable source of opinion might be the detailed analysis of Andrew Stoler, a Visiting Fellow at Policy Exchange, and a former WTO Deputy Director General and Geoff Raby, Head of Trade Policy at Policy Exchange, and a former Australian Ambassador to the WTO. Their analysis can be found on the website Conservative Home and there are many similarly minded from other experts with actual WTO and trade experience. The expertise of the MEP David Campbell Bannerman is particularly helpful in this area and worth seeking out. Finally, regarding the supposed ‘myth’ about what we actually voted for, however Remainers care to spin it, the question was binary: Leave or Remain and David Cameron said the government would abide by the result. The patronising claim that voters ‘didn’t understand what they voted for’ could be applied to any vote at any time, particularly after Gordon Brown’s victory in court when it was ruled that party manifestos cannot be relied upon as promises. In any case if, by some chance, we were to suffer a second referendum, where would he suggest we draw a line? The third, the fourth .. or, as I suspect, the one where the Remain camp gets the answer it wants? Europe surly that’s enough to want to leave. Ok let’s say we’ve just had another vote and call it the people’s vote and the result is status Quo what do we do then keep voting until the remainders are the winner no that is not the democratic way to go We voted to leave and Rudd and May gets our vote and hopefully succeed in there negotiations to get a sensible deal call eu bluff if not then no deal should be considered.Eu needs us probably more then we need them. 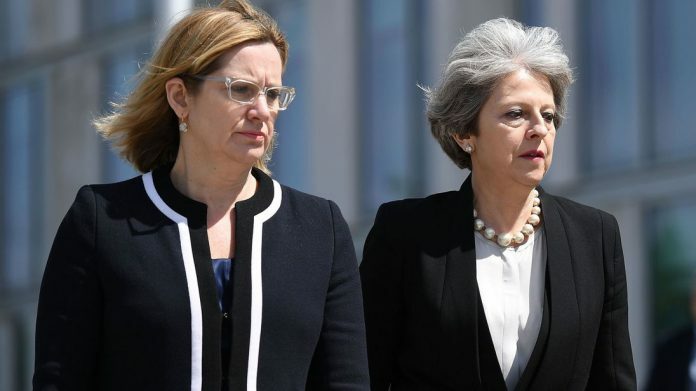 In one of the comments on this news letter says Amber Rudd scare tactics about the horrors of Mr Corbyn Embarrassing.I remember when Jeremy Corbyn hit the headlines for all the wrong reasons in the 70s and 80s so keep May and Rudd in power or let’s have a no deal the trouble is we have a leave population and a remain parliament that’s where all the aggro has been. Spain.Italy.Greece. and Portugal ain’t to happy being in the eu reason being nearly skint. Stick to the matter in hand. Our politicians are trying to sort out an impossible situation. Put up or keep it under your hat. To me it is baffling that Theresa May can state that ‘a second referendum could damage social cohesion by undermining faith in our democracy’. Her party (with the support of the DUP) are in government with the backing of a mere 43.8% of the electorate that voted, in other words 56.2% (is that a majority?) did not support it. Is it not clear that of all the options available, with 48% ‘Remain’ is by far the most supported? Gary Cooper keeps on stating that the referendum was binary – it was absolutely not. It was profoundly flawed in not being specific as to what Vote Leave meant. Why else have armies of Whitehall wonks and dozens of Brexit ministers spent more than two years haggling with the EU? Leave means something different to every Leave voter (including numerous fantasy Brexit options), whereas Remain means exactly the same thing to every Remain voter. So let’s have another referendum, with all the achievable options listed. By all means, ‘No Deal’ should be on that list, although why exactly we would want to emulate Mauritania, which is the only country in the world to trade exclusively under WTO rules, I really do not know. I’m all in favour of democracy – it can’t happen soon enough! May I suggest before any other filming is agreed the Town Council should insist on monies given in lieu should benefit the Town of Rye. If all the MPs voted in accordance with how their constituents voted in the Referendum then that would take the politics out of the equation and allow some serious management decisions to be applied based upon all the risks involved with leaving the EU. This would then be the responsibility of each Department Minister and their civil servants to make arrangements to ensure risk assessments were conducted and arrangements made to accept the conditions or the referendum and apply necessary changes as practicable which would provide the smoothist transition with minimum effect and disruption to normal working day life. Our whole government system is a disgrace. The EU are probably laughing at us behind our backs. The government appears to be made up from a load of amateurs, all acting like school kids. I don’t know what the answer is but something needs to change and fast.